Are you ready to solve the most magical case ever?! Join Inspector Magic and stop evil in its tracks by investigating 12 different locations that are linked to a crime! Complete quests and find clues to solve the mystery! Complete many difficult card deals on your journey, but don't worry, you can handle them! If you like solitaire, solving detective mysteries, studying clues, catching dangerous criminals, or maybe you just love detective stories set in a magical world, this game is for you! 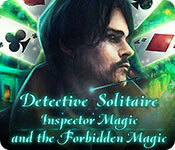 Click to start Detective Solitaire: Inspector Magic And The Forbidden Magic Free Download. Sign-up to get informed when the Detective Solitaire series has new game released with BD Studio Games' FREE bi-weekly newsletter.